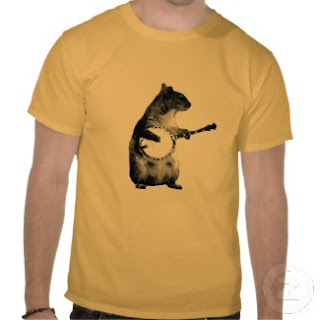 Funny Squirrel Playing a Banjo T Shirt for Men, Women & Kids. You can buy this squirrel shirt here. This banjo-playing ground squirrel has got true rhythm. This excellent shirt design shows a scaled-down banjo in the paws of a photo-based ground squirrel image. Better than a squirrel playing a guitar. Really, few things get better than this. Its a top pick here at Funny Squirrel Shirts. The main drawback is that it isn't also available in a bushy-tailed squirrel version. Then this squirrel shirt would be on all of our family members. On the positive side, it's available in a wide variety of colors, and ninety-two (yes 92!) different styles for women, men, and kids. Can't beat that with a banjo.